I am now, nearly, finished reading Michel Zimmermann’s huge book Écrire et lire en Catalogne that has given me so much difficulty along with its information, only the bibliography and appendices (themselves two hundred pages) to go.1 One of the problems with understanding what is going on with this work is its pedigree. It is a version, little revised, he says at the outset, of his thèse d’état, a huge-scale thing akin to a German Habilitationsschrift that doesn’t really exist in the UK or US systems and doesn’t, any longer, in France either. Firstly, this means that a lot of it dates from a long time ago and when one comes across references to ideas published ‘recemment’ in 1978, one begins to wonder how much it was updated to reflect Zimmermann the learned professor as per 2002 rather than Zimmermann the young scholar as per 1982.2 Furthermore, these beasts could easily be the fruits of a decade’s work and then here he is updating it in the 2000s, so there’s prospect for quite a lot of change of opinions and knowledge even between its chapters. This may explain a thing I found in the last chapter which I didn’t expect, either from the material or the writer, and which for balance I thought I had to mention here. These records are not quite as unambiguous as one might wish.5 We only have the name of one of them, Guisla grammatica, and the other appears as only homo domna gramatika, which looks as if it must be a scribal error in some direction or other, possibly for Hemmo, Emma; the Greek spelling of ‘gramatika‘ gives me strange memories of a lady I met once in Cambridge but also makes me wonder if the scribe thought the word couldn’t be declined, like Hebrew terms, though in that case why did he only know it in the feminine? Moreover, the first is potentially to be identified with a Guisla who was the wife of one Guillem, and he may be one of the other grammatici around the cathedral of Vic at this time, as they certainly had one of that name. In other words, Zimmermann suggests, she might be a grammaticus‘s wife using the family title, rather than actually having any teaching role herself; the cathedral’s grammarians certainly seem to have passed the title down to their heirs, but those heirs presumably also inherited the teaching? We don’t know for sure. But it’s interesting, and it’s also something that based on other parts of the book I wouldn’t entirely have expected M. le Prof. Z. even to have mentioned. Vic was somewhere with a history of encouraging female learning and study in a small way, and it’s nice to think that might have briefly been institutionalised as lay instruction took off more widely in the mid-eleventh century. 1. M. Zimmermann, Écrire et lire en Catalogne (IXe-XIIIe siècles, Bibliothèque de la Casa de Velázquez 23 (Madrid 2003), 2 vols. 4. Zimmermann, Écrire et lire, II pp. 870-886 and here esp. pp. 878-881 for what follows. Continuing to tackle the seminar write-up backlog, I must reluctantly skip over the next paper I went to, Zubin Mistry’s “Tradition in Practice: thinking about abortion under the Carolingians” at the IHR, because it has already been well-covered at Magistra et Mater, which means that five in six of the last posts will have been about Anglo-Saxon England one way or another. Looking back at this, it does become a bit clearer why I was finding it so hard to make progress on things Catalan in Oxford… Anyway, after Zubin’s paper came school half-term, which meant that I unfortunately had to miss one of John Blair’s Ford Lectures, “From Central Clusters to Complex Centres: economic reorientation and the making of urban landscapes”, and whatever was following it the next week in various places, and resume seminar attendance with the fifth of those lectures, “Building the Anglo-Saxon Landscape (5): landscapes of rural settlement”. The subject of this lecture was basically the village, and how and when it moved from being a relatively loose association of linear enclosures to the houses-all-facing-one-road croft-and-toft layout that the English now think of as being typical for an old village. One way at this is via boundary ditches, and there are lots of these known, but eighty per cent of them date from after 1050, and the remainder from the seventh to ninth centuries, with nothing in between! If you buy John’s idea that use of grids and standard measurements bespeaks monastic involvement in laying out the land, even if they just provided consultant expertise when divisions were needed or something (as John thinks detectable at Stotfold in Bedfordshire), then there is presumably rather a lot of less orchestrated settlement that we are simply not seeing here, and in the ninth to eleventh century gap it’s almost all of it. The revival of planning in settlement layout is also almost entirely within the area John had earlier noticed as significant, the catchment of the Wash understood in broad terms, or in other words the east and south Midlands and northern Home Counties extending towards the Thames Valley. In this area we have plenty of what might be warland settlements, but what is oddly lacking is much sign of very large estates such as might belong to major aristocrats. Even the supposed palace sites we have are in relatively minor estates as far as can be told, leading to Cheddar’s description as a hunting lodge.3 As had been discussed in one of the earlier lectures, early and middle Anglo-Saxon high status just doesn’t seem to have had a great deal of immovable expression of hierarchy. In settlements like Stotfold and the more famous Goltho, with whose dating John has strongly-expressed issues, he sees then the housing of the rising low-grade nobility, the thegns vying for social promotion, and sees this as a fairly late phenomenon. What we have here is the burhs that the tenth-century laws required such men to have if they were to claim thegnly status, which raises the question of whether there are fortified examples of such houses.4 To this John’s answer was so characteristic that I wrote it down verbatim: “The answer seems to be, yes there are and they’re egg-shaped!” You may blink somewhat at this but Goltho, and also Fowlmere in Cambridgeshire, another and perhaps better candidate for a late Anglo-Saxon ‘castle’, and Sulgrave, Northamptonshire, all show ovoid ramparts around relatively small halls that fit this expectation, and there are probably more under later Norman motte-and-bailey overlays. That however takes the lectures into something quite like a new society, and this was left for the last one the next week. 1. John had a clutch of references that kept coming up for later medieval villages and settlement, and this time I wrote them down. They were: B. K. Roberts & S. Wrathmell, Region and Place: a study of English rural settlement (London 2002); A. Lambourne, Patterning within the Historic Landscape and its Possible Causes: a study of the incidence and origins of regional variation in Southern England, British Archaeological Reports (British Series) 509 (Oxford 2010); and Tom Williamson, Environment, Society and Landscape in Early Medieval England: time and topography (Woodbridge 2013), the last of which he must have had in draft I assume! 2. I’ve linked to Rosamond Faith’s The English Peasantry and the Growth of Lordship (London 1999), which covers this formulation in great detail pp. 15-136, but another work of hers that kept coming up was eadem & Debby Banham, Anglo-Saxon Farms and Farming (Oxford forthcoming) which is obviously going to be pretty good news for those who are interested in such things when it finally emerges. 3. See once more J. Blair, “Palaces or minsters? Northampton and Cheddar reconsidered” in Anglo-Saxon England Vol. 25 (Cambridge 1996), pp. 97-121, DOI: 10.1017/S0263675100001964. 4. The source here is a tract associated with Archbishop Wulfstan II of York (which puts it in that most dangerous category, draft moral legislation) called Geþyncðo, translated by Dorothy Whitelock as “Concerning Wergilds and Dignities” in her (trans. ), English Historical Documents vol. 1: c. 500-1042, 2nd edn. (London 1979), doc. no. 51(a). On it in this sense see Ann Williams, “A bell-house and a burh-geat: lordly residences in England before the Norman Conquest” in C. Harper-Bill & R. Harvey (edd. ), Medieval Knighthood IV: papers from the fifth Strawberry Hill Conference 1990 (Woodbridge 1992), pp. 221-240, repr. in Robert Liddiard (ed. ), Anglo-Norman Castles (Woodbridge 2003), pp. 23-40, and more generally W. G. Runciman, “Accelerating Social Mobility: the case of Anglo-Saxon England” in Past and Present no. 104 (Oxford 1984), pp. 3-30. When I wrote the bulk of this post in September 2012, I had lately read an article I should have looked at long previously, by Charlotte Behr, called “The Origins of Kingship in Early Medieval Kent”.1 It’s is a rather odd piece of writing: it’s thoroughly academic and erudite but it still reads somewhat as if the author had left notes in the margins of things they had meant to mention later and a scribal error had then incorporated them into the main text in the wrong places; it digresses a lot. I read it after a solid week of copy-editing the final version of Problems and Possibilities of Early Medieval Diplomatic, so I itched to do a major hack job on this article, but this is not much good with something in print for twelve years already and it has made me think, so it’s obviously not bad. I just, would maybe have pushed it a bit further. A seventh-century gold bracteate pendant from a cemetery at Faversham in kent, now in the Ashmolean Museum Oxford, object no. 1909-194. What Dr Behr argues is that even though Bede tells us the men of Kent (as opposed to the Kentish men) were Jutes from Jutland, Scandinavian material culture only shows up there with any strength from the mid-sixth century onwards, after we presume any migration to have happened. (Yes, I’m not sure about the assumed links there either, but let’s roll with it for now.) Even once visible, that Scandinavian signal is swamped in Frankish-style goods both imported and locally-made, but it is there. Furthermore, Dr Behr argues that: (a) it is especially to be identified in gold bracteates, which in Kent are almost entirely found in wealthy female graves (though this is not their usual Scandinavian context), (b) these bracteates are related in iconography (and occasionally even in runic text) to the cult of Woden, and (c) that that, as far as place-names can tell us, was confined to one small area of Kent which is also busy with major élite sites, the chief of which are the cemetery of Finglesham, where a ‘founder’ warrior grave became the focus for three centuries of interments, Eastry, where a later villa regalis (royal vill) is well-attested and burial also occurred from early on, and Woodnesborough (‘Woden’s barrow’), presumably the religious site, to which could be added the coastal site of Sandwich as the fourth part of a rather nice little royal development complex linked to Dover and Canterbury by Roman roads.2 Moreover, the bracteates found here and more thinly elsewhere in Kent are all of one specific type, with an identifiably single prototype, suggesting that they were locally-made on demand for a single group who were pushing themselves as Scandinavians in some respect or other. Now there are bits of this that aren’t logically present in the article but need to be to connect these things up, I think. The conclusion seems perfectly plausible, it’s the sort of thing we’re encouraged to see as behind the goods in the Sutton Hoo ship burial as well, and it lines up with a lot of work going on at the time Dr Behr was writing that encouraged us to see southern Scandinavia as a kind of alternate locus of power and importance which gets its brief spotlight period in the aftermath of the fall of Rome.3 However, the bracteates aren’t die-linked, so there’s not a lot to say that those showing up outside this little core zone aren’t good imitations. That would also work in terms of showing it was an attractive way to represent oneself, I suppose. The fact that it’s almost always women is also interesting, too; should we imagine this ideology being something men can join in with by marriage? Have we then got a successful (and potentially actually Jutish, I feel it should be said, if that term means anything beyond `from Denmark’) warrior family having established themselves at Eastry and area, with their portus at Sandwich, then making links with other élites in sites like Dover and across the water in Francia too that got cemented by marriage, and shortly becoming the number one power in sixth-century Kent? I like this because it would allow so many things to be true at once: it could accommodate a genuine migrant warrior group moving into a fragmented power vacuum in eastern Kent and a small family quickly becoming powerful by genius of location and resources and by skilful manipulation of a politically-useful identity for which one could hand out almost literal badges of membership and that other people apparently wanted to join. (I do wonder what the men in this group wore, but whatever it was apparently we haven’t found it as such.) It was such a good appeal to legend that by the time they were remembered in the eighth century Bede knew, or his informant knew, that the founder had been a legendary warrior and Hengest was the name they knew best for the time. And his story would then actually be relevant, explanatory and important! These pseudo-Hengests would have pulled together a small but wealthy kingdom in the space of a couple of generations, substantially just by having a good starting position and an obvious Frankish problem for which they could advertise themselves as the solution. (“No more tribute to the sons of the sea-monster! Choose Jutes for Woden!”7) And then one of the family that must have set up in Canterbury somewhen (and let’s call their founder Oisc) got in on the act and, as luck and skill with a blade and a retinue would have it, completely cleared the floor over most of the south of England, sending the political axis skidding backwards and forwards between Francia and Scandinavia until some well-timed missionaries arrived to offer a third way (unbeknownst to them) and the whole game changed scale. This is, of course, completely unprovable (though one could wish for DNA testing of the female skeletons with the bracteates) but it fits very much with how I have long tended to see the Anglo-Saxon settlement: not many people but a few clever and lucky ones in just the right place and at just the right time to make something that became history. 1. C. Behr, “The Origins of Kingship in Early Medieval Kent” in Early Medieval Europe Vol. 9 (Oxford 2000), pp. 25-52, DOI: 10.1111/1468-0254.00058. 4. All this is best covered by none other than the late lamented Nicholas Brooks, in his “The Creation and Early Structure of the Early Kingdom of Kent” in Stephen Bassett (ed. ), The Origins of Anglo-Saxon Kingdoms (London 1986), pp. 55-74. 5. Behr, “Origins of Kingship”, p. 28. 6. Ian Wood, The Merovingian North Sea (Ålingsas 1987), put more lightly but also more easily obtainable in his “The Fall of the Western Empire and the End of Roman Britain” in Britannia Vol. 18 (London 1987), pp. 253-262. We now reach a point in my seminar backlog where before I get one version of a paper written up I have already seen a later version, but I don’t know what to do about that that isn’t do what I would do anyway, so, let me tell you about the work of Tom Lambert. Tom definitely counts as one of the friends I made in Oxford, so this is a friendly write-up, but that’s not hard, as Tom’s stuff is really sharp,1 and, on 4th February 2013, he was performing it to the Medieval History Seminar in Oxford under the title, “Crime, Community and Kingship in Anglo-Saxon England”. However, as Tom pointed out, even the earliest Anglo-Saxon laws we have, those of King Æthelberht of Kent, have some areas of action reserved to the king, things for which he takes fines.3 That’s what makes something a crime in this thinking, rather than just an injury deserving vengeance, the declaration of a public power that it needs public action. This is the area of jurisdiction that expands, but why is it there at all? Tom’s answer was that these things, largely failures of religious observance or breach of peace, are things for which there is no obvious victim. The community as a whole may be offended, they may even be punished by God collectively (because this is a thing that is well-known to happen to Anglo-Saxon England) but there is no specific person whose responsibility it clearly is to take vengeance. For that kind of offence, you need someone who represents everyone, i. e. the king. The concomitant of this, however, is that for everything else, feud was considered an adequate mechanism of restraint. This is not to say that Anglo-Saxon England was a simmering cauldron of violence: compensation was probably the rule—it’s certainly what most of the, well, rules, in the earliest Anglo-Saxon laws are about—and it could be demanded at a public assembly, indeed; the system is still a vengeance one, though, in which adequate reprisal and restoration of offended honour has to take place when a person suffers injury at another’s hands. What the laws did here, here, again as Tom sees it, is assure people that a certain level of compensation was in fact adequate for a certain injury. Otherwise, as Tom pictured eloquently for us, the offended party would always be encouraged to escalate, for fear that by accepting too little compensation his ability to defend those whose protection was his affair would be cast into doubt and his honour among his peers diminished. A lawcode, by setting tariffs that could be agreed as reasonable and adequate, might avert that doubt and its over-compensation, as well as making the king look like a Roman ruler and other things like that as identified by Wormald. 1. Even at this point his stuff was also in print as T. Lambert, “Theft, Homicide and Crime in Late Anglo-Saxon Law” in Past and Present no. 214 (Oxford 2012), pp. 3-43 and idem, “The Evolution of Sanctuary in Medieval England” in Paul Dresch & Hannah Skoda (edd. ), Legalism: anthropology and history (Oxford 2012), pp. 115-144. 2. Paul Hyams, “Feud and the State in Late Anglo-Saxon England” in Journal of British Studies Vol. 40 (Chicago 2001), pp. 1-43; Patrick Wormald, The Making of English Law: King Alfred to the twelfth century. 1: Legislation and its limits (Oxford 2001). 3. Printed in full and translated in F. L. Attenborough (ed./trans. ), The Laws of the Earliest English Kings (Cambridge 1922, repr. New York City 1963, Felinfach 2000). 4. John Blair, “The Dangerous Dead in Early Medieval England” in Stephen Baxter, Catherine Karkov, Janet Nelson and David Pelteret (edd. ), Early Medieval Studies in Memory of Patrick Wormald (Farnham 2009), pp. 539-560. The implications of this are quite interesting if you pull them out from a westerly direction. The idea that nobody owes anyone else a living is explicitly contraverted here: in a properly-ordered polity by this scheme, everybody should have a living and so it’s the responsibility of the ruler to provide the demands that people are equipped to supply, by reason of their skills or the natural resources of their communities and so on. There must be a farther edge at which it ceases to apply, a commodity one could produce that even despite the Mughal court’s love of novelties (which Bayly explains as assisting to demonstrate the infinite variety of the emperor’s dominions,3 an argument to which my own of earlier about Charles the Bald and Judas makes me sympathetic) the emperors would find too silly or trivial to establish a demand for, and as them so much more so the local élites (them again). But in its basic form this balanced set-up has a certain logic to it that is neither socialist nor capitalist (though the idea that the state should find employment for people when no-one else can is obviously not unrelated). Naturally enough, perhaps, I then thought of early medieval courts, which we are also now taught to see as centres of consumption and patronage for craftsmen and merchants.4 This is usually fairly pragmatic: by aggregating to itself the monopoly on the distribution of luxuries and prestige goods, the ruling class make themselves indispensable to those who wish to acquire the kind of status that those goods bring. (That is of course not the only kind of status at these courts, as Bede’s stories about bishops giving away precious-metal gifts to the poor or Columbanus’s harangues of profligate and polygamous Frankish monarchs amply demonstrate.) One gets this status because one can spend it, it’s Bourdieu’s idea of symbolic capital. And even with Bayly’s picture on India that’s not missing: the king gets great status from being able to make gifts, especially in cloth since in that inheres the royal persona, with which the recipient can join for a while.5 But what’s also sticking with me is the idea that the patron is obligated to support the producer. It puts me in mind of the Anglo-Saxon laws that gather the legal protection of merchants to the king, usually assumed to be because no-one else will do it since, as travellers, they lack a nearby source of support from kindred and clientage groups.6 And of course the king needs the merchants, for all the reasons above, and he also needs the craftsmen, and it’s advantageous to him to have some reason to get them to court where he can control what they make for whom. So that system has its own logic and it doesn’t need this social ethic to make it run. But I am, all the same, wondering if it has room for that ethic anyway. Once the king acknowledges that these people are his responsibility in some way, it’s obviously to be expected that they would appeal to him. But had that been the case for longer? If one learnt to make really intricate brooches or whatever, was one not already making one’s support the business of the kind of élites who could get the stuff with which you could work? Is not, then, to learn such a skill to expect élite support? Is a ruler of this period obliged to maintain crafstmen and other sorts of specialist (ritual, military…) not just because he needs them and can use them but because, once they have specialised, he is the only support they have? There’s several reasons why this comparison fails in places, I think. Firstly the goldsmiths and whatever don’t easily fit next to Indian weavers, because ultimately (one of the points of Bayly’s article, which is centrally about the swadeshi campaign to revert to home-made cloths in the face of British imports) any household with access to the raw material, which you can grow or raise, could make cloth, albeit not necessarily fine cloth (silk weaving might therefore still work) but not everyone could get enough gold to make a sword pommel. Secondly, Mughal India was socially more articulated and was running at least two competing religions and there were lots more ringfenced zones in its market economy where specialism could flourish than in early medieval Britain, for example, where élite households and big churches were most of it. The idea of being a professional weaver in Anglo-Saxon England is already pretty odd, let alone there being extensive caste prescriptions about their status. There are also places I don’t want to take it, one being that many an early medieval ruler also had similar obligations of protection to Jews, who do not contribute to his prestige and importance in so direct an economic way,7 and the other being the modern parallel invoked by the title, that of the higher education ‘industry’ in which because we can produce something, whose significance is not solely or even basically economic, and wish to continue doing so, we strongly assert (but struggle to demonstrate) the necessity of the goods we can provide to society.8 As with many an anthropological comparison thinking with other people’s assumptions invites us to check our own. But as I say, those would be thoughts for another post and I find the medieval relevance, even if I had to struggle to get it, interesting enough. 1. C. A. Bayly, “The origins of swadeshi (home industry): cloth and Indian society, 1700-1930” in Arjun A. Appadurai (ed. ), The Social Life of Things: commodities in cultural perspective (Cambridge 1986), pp. 285-321. 2. Ibid. p. 298; see also p. 302. 4. Richard Hodges, “King Arthur’s Britain and the End of the Western Roman Empire” in idem, Goodbye to the Vikings? Re-Reading Early Medieval Archaeology (London 2006), pp. 28-38, provides a punchy system statement; more broadly see Catherine Cubitt (ed. ), Court Culture in the Early Middle Ages: the Proceedings of the first Alcuin Conference, Studies in the Early Middle Ages 3 (Turnhout 2003). 5. Bayly, “Origins”, pp. 297-300. 7. I’ve not really found anything good on the position of Jews in early medieval society; the literature about Jews tends to get going once society starts persecuting them and they start to appear in their own sources. Before the eleventh century this is hard to find, and the opposite easier. We’ve already seen that Jews were not so mistrusted that they couldn’t be used as envoys to a king, and I can also point you to a charter in which two Jewish landowners (yes) come to Louis the Pious to complain that they can’t get justice at the local mallus; it is Claude Devic & Jean Vaissete, Histoire Générale de Languedoc avec les Notes et les Pièces Justificatives. Édition accompagnée de dissertations et actes nouvelles, contenant le recueil des inscriptions de la province antiques et du moyen âge, des planches, des cartes géographiques et des vues des monuments, aug. É. Mabille, E. Barry, E. Roschach, A. Molinier, ed. M. E. Dulaurier (Toulouse 1875, repr. Osnabrück 1973), 12 vols, II, Preuves : chartes et documents, no. 97. 8. Necessity is of course the wrong metric; we should be arguing for desirability, which is why the powers-that-be have stuck us with the former in the form of ‘impact’; we can’t prove it so they don’t have to pay us for it… More on this in due course. I wrote this offline while WordPress continued not to have visibly done anything that made me prepared to log in, so I feel slightly less bad about the consistent fourteen-month-backlog with my seminar reports than I might do. Slightly. 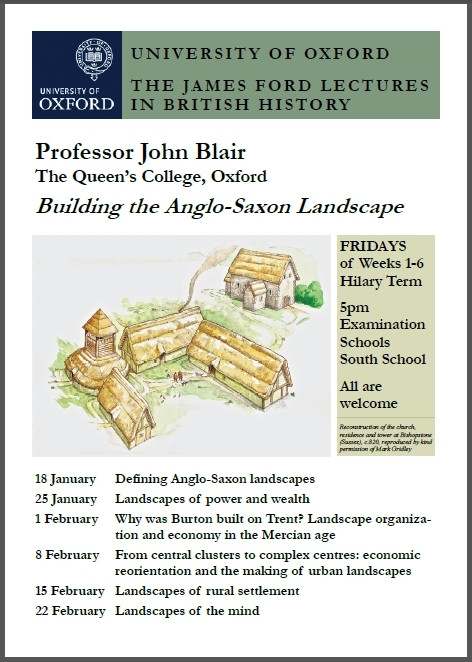 But with that expressed, let’s immediately turn to it in the person of fellow blogger Mark McKerracher, who on 4th February 2013 addressed the Oxford Medieval Archaeology seminar with the title “Mid-Saxon Agriculture Reconsidered”. I got to this one slightly late but I think I got most of it, and very interesting what I got was, also. I suppose it is worth first making the case that we really do need to know about farming in the Middle ages: it was the source of almost all wealth and the main activity of the vast majority of the population. If we don’t understand it, we don’t understand what is really the first thing about what the people we study did and cared about and how any of the other stuff they did was possible. Nonetheless, there is much here that we don’t understand, and for England this has actually got worse in the last few generations as archæology has improved, because old models, in which after a near-total reversion to pastoralism in the wake of the Roman withdrawal and the Anglo-Saxon invasions, the heavy plough arrived from the Continent in the ninth century and water-mills shortly after and in general set things up for an Agricultural Revolution that would explain England’s subsequent economic punch, have collapsed as we have found, for example, seventh-century heavy ploughs, eighth-century tidal mills, massive levels of seventh- and eighth-century monetisation compared to the later periods of supposed ‘take-off’ and so forth, and failed to find very much sign of fifth-century agricultural land going out of use in any case.1 Almost all the studies trying to deal with this have been economically-focussed, however, and very often on trade and proto-industry, whereas the base of the economy must have been and remained agricultural.2 So it is arguably in farming that change is most important, but also where it is hardest to actually find. 1. It seems unfair to target older books for what their authors couldn’t have known; there’s a reasonable round-up of the literature on the take-off of the tenth century (which is to say, more or less a take-off in the preservation of our sources on economic matters) in Christopher Dyer, “Les problèmes de la croissance agricole du haut moyen âge en Angleterre” in La croissance agricole du haut moyen âge : chronologie, modalités, géographie. Dixième Journées Internationales d’Histoire, 9, 10, 11, Septembre 1988, Flaran Vol. 10 (Auch 1990), pp. 117-130. I’m sure there must be one in English as well, but remember I don’t actually work on this stuff, that’s the one I’ve read. The most aggressive statement of a case for a revolutionary change is indubitably Richard Hodges, The Anglo-Saxon Achievement: archaeology and the beginnings of English society (London 1989). 2. Especially Hodges, Anglo-Saxon Achievement, or his “Society, Power and the First English Revolution” in Il Secolo di Ferro: mito e realtà del secolo X, Settimane di Studio del Centro Italiano di Studi sull’Alto Medioevo Vol. 38 (Spoleto 1991), pp. 125-157, repr. in Hodges, Goodbye to the Vikings? Re-Reading Early Medieval Archaeology (London 2006), pp. 163-175. 3. Here I’m obviously influenced by Morn D. T. Capper, “Contested Loyalties: Regional and National Identities in the Midland Kingdoms of Anglo-Saxon England, c.700 – c.900″ (unpublished doctoral thesis, University of Sheffield, 2008). 4. Two good early examples of how this kind of work can underpin historical conclusions are Leslie Alcock, Dinas Powys: an Iron Age, Dark Age and Early Medieval Settlement in Glamorgan (Cardiff 1963), reprised and updated in his Economy, Society and Warfare among the Britons and Saxons (Cardiff 1987), pp. 5-150 where the animal bones are discussed pp. 67-82, and Jennifer Bourdillon, “Countryside and town: the animal resources of Saxon Southampton” in Della Hooke (ed. ), Anglo-Saxon Settlements (Oxford 1988), pp. 177-195. Posted with apologies for the delay in both posting and in dealing with comments, for once not because of my life but because of WordPress being uncharacteristically useless in dealing with the Heartbleed bug I hope you heard about, let’s attack that easiest of targets, to wit, historiographical views on ethnicity. Here is a straw man: let us once more consider the Visigothic Law. Redacted principally in the reign of King Chindasuinth of what we know as the Visigothic kingdom of Spain on the basis both of ‘ancient’ law and subsequent royal edicts, in the form we have it it had been updated by several subsequent rulers and was intended to be widely owned and consulted, as indeed the numerous copies we have of it suggest it was.1 Surely this is the ultimate expression of a Visigothic identity, matured by years of rule and a full conversion to Catholicism? So if that’s Gothic, what went before must be Roman, no? Well, no, obviously not, you may immediately say: firstly the premise is rubbish, but also the artwork is hardly Classical, is it, there is interlace, geometric ornament and the oval-eyed staring faces characteristic of pre-Romanesque portraiture of the earliest kind, or indeed of the earlier copies of the illustrated Commentary of Beatus on the Apocalypse.2 Also, it is, you know, the Breviary of Alaric, that being King Alaric II of the Visigoths, named after their most successful leader, the guy who actually sacked Rome… This is if anything more Gothic, you may say. But what is this text? It is a codification of Roman law. On the left-hand page of the spread you may even be able to read the name of the Emperor Theodosius, under whose orders the Codex Theodosianus, of which the Breviary is as the name suggests an abbreviation, was compiled, about fifty years after its issue. That’s him in the picture, not Alaric. That’s how Gothic this is. Now, we can complicate matters further, because this is also Carolingian. That is, this actual manuscript, now in the Bibliothèque nationale de France, was made and illustrated in the Frankish city of Narbonne in the early ninth century.3 Admittedly, Narbonne had only fallen to the Franks in 759, when the local ‘Goths’ (as the Chronicle of Moissac does indeed call them) decided that between the Muslims inside the city and the Frankish army outside they’d rather take their chances with Charlemagne’s dad Pippin the Short, and threw the Muslims out and made terms. One of the terms was that they got to keep their own law.4 Which one, do you suppose, this one? or the ‘Visigothic’ one? Either way, this is at least two generations after the conquest and yet it was still being copied, a Gothic compilation of Roman law copied under Frankish rule in a city they’d freed from the Muslims depicting the Roman emperor who hadn’t issued it in a style some would happily call Mozarabic. Assign an ethnicity to that. 1. The canonical cite here is Aquilino Iglesia Ferreirós, “La creación del derecho en Cataluña” in Anuario de Historia del Derecho Español Vol. 47 (Madrid 1977), pp. 99-423, now revised in his La creación del Derecho: una historia del Derecho espa&ntidle;ol (Barcelona 1988), 3 vols, 2nd edn. (Barcelona 1989-1991), 3 vols. 2. The fullest study of these manuscripts is John W. Williams, The Illustrated Beatus (New York 1994-1998 & Turnhout 2000), 5 vols, but shorter introductions to the text and what it was doing can be found in Williams, “Purpose and Imagery in the Apocalypse Commentary of Beatus of Liébana” in Richard K. Emmerson & Bernard McGinn (edd. ), The Apocalypse in the Middle Ages (Ithaca 1992), pp. 217-233 or Kenneth B. Steinhauser, “Narrative and Illumination in the Beatus Apocalypse” in Catholic Historical Review Vol. 81 (1995), pp. 185-210. References to it as Mozarabic are trivial to find, though almost any use of this word is misleading: see Richard Hitchcock, Mozarabs in Medieval and Early Modern Spain (Aldershot 2008). 3. It is Paris, BN MS Lat. 4404, and the attribution is from Jordi Camps (ed. ), Cataluña en la época carolingia: arte y cultura antés del Románico (siglos IX y X) (Barcelona 1999), no. 129 (p. 382). 4. The best account of this is still Josep María Salrach i Marés, El Procés de Formació Nacional de Catalunya (segles VIII-IX), Llibres a l’Abast 136 & 137 (Barcelona 1978), 2 vols, I pp. 5-7, but I should also mention the new and useful summary in Cullen Chandler, “Carolingian Catalonia: the Spanish March and the Franks, c. 750-c. 1050″ in History Compass Vol. 11 (Oxford 2013), pp. 739-750. The Chronicle of Moissac is printed in Georg Heinrich Pertz (ed. ), Monumenta Germaniae Historica… Scriptorum tomus I, Monumenta Germaniae Historica (Scriptores in folio) I (Hannover 1826), pp. 280-314. 5. E. g. Karl Zeumer (ed. ), Leges Visigothorum, Monumenta Germaniae Historica (Leges Nationum Germanicum) I (Hannover 1902, repr. 2005), transl. S. P. Scott as The Visigothic Code (Boston 1922), online here, III.1.2 ruling that mixed marriages are legal; slightly more respect for remaining differences in X.1.8, 9 & 16 & X.2.1 & 5 probably have to do wth the fact that here rights in land that could have been inherited are concerned. II.2.2 is adamant that everyone, even the king, is subject to the same law and II.1.8 refuses to recognise any other Roman law than what is compiled into the Forum. 6. 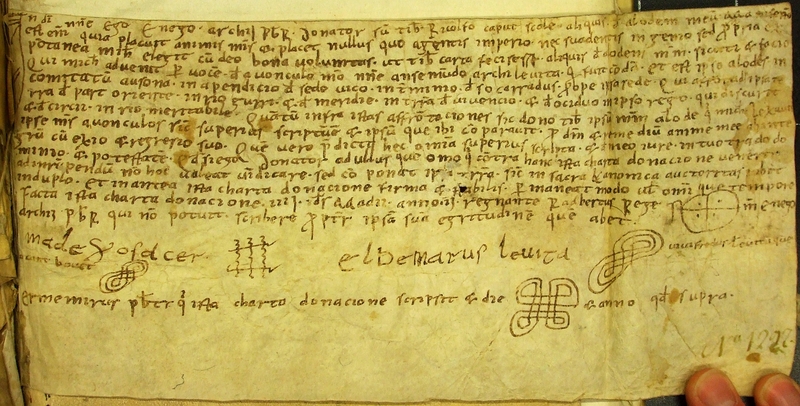 Jeffrey Bowman, Shifting Landmarks: Property, Proof, and Dispute in Catalonia around the Year 1000 (Ithaca 2004), pp. 33-55.